Maria is an exceptional Educator who is very experienced with many years of home based childcare and uses her calm approach to establish the rapport with the whānau. Many of Maria’s whānau choose to return to her with their younger siblings and appreciate the responsive and reciprocal relationships she maintains with the whānau and continues this relationship after they have moved onto school. Maria has wonderful organisational skills that she puts to good use to document and keep on top of the required paperwork. Maria is always looking on educational websites to avoid getting stale and stagnant with any recent developments in the early childhood sector. This generates creative ideas for furthering the education and individual goals of each tamariki. Maria embraces Haerenga/outside activities and views them as learning experiences that enhance her programme. Maria is constantly adding to her resources with the addition of her playhouse and large sandpit and slide. Then later on adding the playroom which is connected to the house and added in carpet and displays her art and craft resources in this room. Going on visits into the local community and walks into the local Tuataphere domain supports learning across all the strands of Te Whāriki, in particular, the contribution strand supports Tamariki learning with other Tamariki. Maria has used a map that the tamariki had to follow which identified local landmarks for the tamariki to identify. Belonging and well-being strands encourage tamariki to develop comfort with a moderate degree of change. Maria uses these outing to tautoko (support) the children’s strengths and individual goals. An example was a kotiro (girl) Maria had who needed to build on her co-ordination and Maria would utilise the music session with a lot of body movements to encourage her awareness of her movements and also using her own body weight to pull herself up a tree and climbing up and down ladders and including balancing on the uneven planks outside. The success of her continued development was because of the wonderful continuity that Maria provides to always find ways to work on an individual goal and to document this progress. Maria readily takes on advice and guidance after discussion during one of our home visits, it was suggested the idea of creating a carpentry table to enhance fine motor skills and gross motor skills in her tamariki. This is a project that she has begun to undertake, providing updates to me during my home visits stating her progress and involves the Tamariki in the decision-making for many things such as resources and outings into the community. Maria is building confident, competent independent tamariki who have the social competencies to be ready for a smooth transition to Waiau and Hauroko Valley school. Maria has an uncanny ability to get the bottom of her Tamariki learning and reaching their goals and her documentation of their learning journey is fantastic. Her photo’s, story and the Tamariki voice are all visible and you gain a very good perspective of where they are at and where they are heading to next. 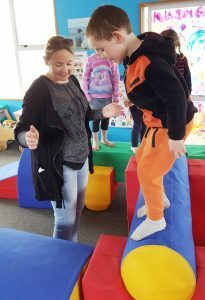 Maria shares her understanding of child development and of the child, their learning progression is often revisited as a demonstration and evidence of milestones and individual goals being met.